Drones in Roofing – Fad or the Future? Home/News/Drones in Roofing – Fad or the Future? What do you think of when you hear mention of Drones: covert military operations, search and rescue missions, or hobby flyers causing panic near airports? While these examples reflect the more glamorous or newsworthy use of drones, there is a growing use in the construction sector, including roofing – but is this a passing fad, or a genuine technological advance that could become a mainstream part of roofing surveying and inspection? In recent months MAC member Sussex Asphalte has tested the use of unmanned aerial vehicles (UAVs) or “drones” to see what potential they have and their experience to date has been positive. There are two striking first impressions you get when viewing a drone survey. Firstly, how small and versatile drones are; and the quality of the footage the aerial survey delivers – with high resolution images and 4k footage providing crystal clear pictures of roofing detail. Drone pilots typically programme the drone to fly plotted co-ordinates so that thorough coverage of the roof and its edges are filmed. Once mapping is completed pilots fly the drone to focus on any areas of concern, for example, client requests for close-ups on chimney breasts, trim, and gutters in addition to the general roof condition. As well as generating film and stills, drone footage can be downloaded onto software that enables creation of a 3-D image of a roof area, from which measurements can be taken between any points on a roof – vertical upstands, as well as horizontal. So, what are the potential advantages of using a drone instead of traditional surveying and inspection? Firstly, the cost is not prohibitive. Recently, Sussex Asphalte was asked to inspect a roof that had no means of access other than erecting scaffolding or using a cherry-picker. The affordability of good quality drones and a healthy number of qualified pilots offering drone surveys means that it’s not as expensive as you might initially fear. 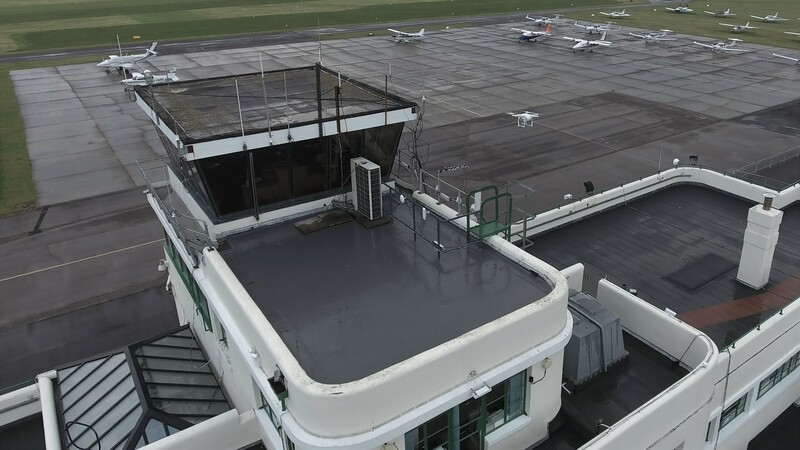 In this case a drone survey was a cost-effective solution providing footage and stills that enabled diagnosis of the condition of the roof, detailed measurements, and a specification of works that has subsequently been commissioned by the client. Another benefit is that the quality of drone footage is so good that producing “before and after” footage of roof repairs can provide customers – especially domestic customers – with the detailed evidence of the need for repairs and the works undertaken. In a recent contract on a block of flats in Worthing, Sussex Asphalte supplied the Residents Association with a drone film that could be shared with residents so that they could view work in progress. Finally, businesses that are prepared to test and use new technologies such as drones could give themselves a competitive edge, demonstrating a forward-looking approach to their work and services. It’s hard not to be impressed by high quality professionally footage filmed from a high vantage point over a building – all of which shows the Company in a good light. Looking to the future, there is the possibility of using drones to undertake thermal imaging surveys that could help demonstrate heat loss through roofs and the benefits of new insulation and asphalt installations. While there are undoubted benefits, it’s unlikely that you would need or want to deploy drones regularly. The planning and preparation for drone surveys does increase lead-in time. Instead they should be used selectively where they can offer a practical alternative or real added value to traditional methods. Sussex Asphalte have taken the view that commissioning a drone survey is a specialist service that it sub-contracts rather than does in-house. Any company using drone services should ensure the drone pilots are qualified and licensed with the Civil Aviation Authority to undertake the safety checks and planning before a survey can take place. While the use of drones has experienced some justifiable bad press, the likelihood of increased regulation and the growing availability of properly qualified drone surveying services means that roofing companies can easily steer clear of unlicensed pilots and find real benefits from this new and exciting technology.